What to do if your Website Visitors Aren’t Ready to Buy? Most people who visit your website, no matter how well-optimized it is as a sales generator, won't buy from you the first time they see it. This is especially true when expensive products are involved. It's also true in the B2B world where buying cycles are often lengthy, complex and require multiple decision makers. Like so many window shoppers and “tire kickers” in the offline retail world, first-time visitors may be “just looking” but could be convinced if you made an offer that was compelling enough. With effective online marketing you can turn casual shoppers into eager buyers. Today, let's talk about how. Remember this, but don't be discouraged by it: most website visitors won't buy from you at all. Up to 98% of them will leave without buying and will never come back (effective online marketing can lower this number quite a bit). Most who are at least somewhat interested won't buy right away. Chances are that when they are ready to make that buying commitment, they will have long since forgotten about you and will go to one of your competitors, unless you remind them about what you can do for them. If you'll do some effective marketing that frequently reminds them about you, many of those will buy from you in the future. How can you do that? The term “sales funnel” is used to describe the process visitors go through on their way to becoming qualified leads and ultimately buyers. The sales funnel is the path they follow from the time they first visit your website until they purchase, or drop by the wayside. Rather than engage in a detailed analysis of funnel performance and structure, let's talk about a very useful tool for moving prospects through the funnel to a buying decision (more on this in a moment). Online marketers often become so obsessed with website traffic that they tend to ignore the very important requirement of turning that traffic into leads and customers. Granted, traffic is important. You need plenty of website traffic in order to have a profitable online business. So don't ignore proven traffic generation strategies such as social media and SEO/SEM. But place your main focus not on traffic, but rather on converting visitors into buyers. You want to encourage them to spend ample time on your website, not arrive and quickly leave. You want them to return to your site often. You want them to think about your product or service as a possible solution to the problem they so desperately want solved, the one that drove them to do a web search and visit your site in the first place. You want to attract eager, qualified buyers. A strong sales funnel can help you do all of these these things. So how do you get visitors to take the journey into and through your funnel? How do you communicate with and nurture a relationship with them, the kind of relationship most likely to lead to a sale in the future? A proven, very common method is email marketing. You build a responsive email list eager to read the great content you send them. This builds trust and can help them get to know you, two things that can help turn website visitors into eager buyers. Understand that your visitors aren't sitting around thinking “I wish I could join another email list. I just don't have enough to read!” They aren't anxious to receive more email. So “sell” them on the idea of joining your list. Have a call to action on your email signup form as well as brief snippets of copywriting that hint at the juicy benefits they'll receive when they do. Make your email list signup form easy to find. Don't bury it 5-10 pages deep. You want it to receive maximum exposure. Put it on your homepage and make it impossible to miss! Offer your website visitors a free valuable report related to your business if they will join your list. For example, let's say you are a physical fitness trainer running a bootcamp. The ultimate goal of your website, funnel and email marketing is to increase membership in your bootcamp classes. You are trying to attract prospects that want to enjoy a high level of physical fitness and reach a healthy weight. You could write a special report on effective weight loss strategies, a report you only offer to those who sign up for your email newsletter. So your website visitors have opted into your email list, and you've sent each of them your special report. You now need to email them on a regular basis. Remember this content marketing cornerstone philosophy: give the reader plenty of valuable content that he can benefit from even if he never becomes your customer. But keep in mind your ultimate goal isn't to give away useful information. It's to sell your products. Don't be “over the top” about it, but don't be afraid to have some very persuasive sales language in your report, including a strong call to action. Don't be afraid to sell to your list. You've given them valuable free content. If some complain to you or unsubscribe because you include sales messages in your emails, stand your ground and let them complain or unsubscribe. Wouldn't you much rather have a smaller, more responsive list that embraced your sales messages and actually bought from you than a large list that resented you trying to sell anything to them and never bought anything, even though they devoured your free content? So how often should you mail your list? The correct answer is... it depends. There are lots of opinions on this subject. Some email marketers are adamant opposed to sending emails more than once every week or two. Some are very successful sending email every day. It might take a while to arrive at your optimal solution. This is something you will want to test and refine over time. As far as when you should send your emails, this also depends, and it's something you should test. Some days and times will be more effective than others. It also stands to reason that optimal B2B send times will be different than B2C. For B2B, don't send emails to your list on Mondays, but try and test sending them on Tuesdays, Wednesdays and Thursdays. Avoid Fridays. Consider sending B2C emails on Sunday. A lot of people check their personal email and do online shopping Sunday afternoons and evenings. If you've decided to try sending emails more than once a week, the main advice I have is to test. See what appears to be working, and do more of it. Avoid repeating what didn't work. Most people who visit your website will never buy from you. Not everyone who joins your email list will become a buyer. But by using effective email marketing as part of your online sales funnel, you will win the business of a substantial percentage of those who visited your website initially but weren't ready to buy at the time, and would have forgotten about you if you had not reached out to them often. As you send emails over time to those prospects in your funnel, some will be prompted to buy from you. Email marketing, done well, is a very effective tool for moving prospects through your funnel. Granted, some will unsubscribe from your list and will exit your funnel before they buy. Don't worry about this. Not everyone on your list will be a true prospect for your products. Understand your target market intimately, and write to them. Don't worry when those who aren't part of your target market drop out of your funnel. An Online Marketing Tool You Need! To be effective, an online sales funnel is going to require lots of work to set up and maintain. When casual, first-time visitors become eager, qualified leads, they are valuable to you! But they aren't yet sold. You haven't converted them from lead to customer, and you can still lose out on their business. As we've often said on this blog, the online marketing process is fragile. Potential customers can suddenly drop out because they lost interest or got distracted. You want every part of your online marketing machinery to be “well-oiled” and “dialed in”. And your landing pages are no exception. They are an important piece of your online marketing puzzle. You can have all of the steps leading up to the point of conversion operating smoothly and then lose sale after sale because of a poorly performing landing page. So it's worth it to focus on the elements that make up a great landing page – copywriting and content, design, including graphics and images, call to action button placement and so on. It all matters. And since you're putting so much effort into producing a great landing page, why not give yourself an “unfair advantage” over your competitors? Not all landing page templates are “created equal”. Why not harness the power of Lander, the easiest-to-use landing page platform in the Universe! These are just a few of the many features every Lander template is loaded with. Indeed Lander gives you a lot of tools to help you enjoy the kind of conversion success you're longing for. And here's a “feature” we're confident you will love: you can try any of Lander's state-of-the-art landing page templates for free and with no obligation. 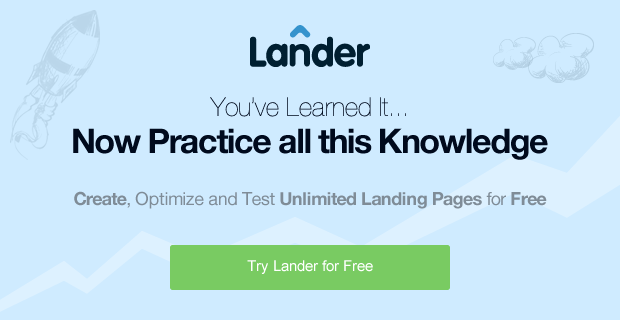 Any questions about Lander and how it can help launch your online marketing results into the stratosphere? Contact us today.